Welcome to my first ever NOTD post! First of all, I have a little confession to make: I'm a beauty blogger with an ever growing collection of nail polishes that I hardly ever use! This is kind of embarrassing and a little silly, right?! Maybe I should try and explain a little bit. It's really not that I don't love nail polish, because I do, it's just that a) I'm very impatient and can't wait for my nail polish to finish drying so it ALWAYS gets smudged b) I have a fairly practical, hands on job and my nail polish always ends up gets badly chipped at work c) being an musician, I have to keep my nails very, very short so I don't damage the strings on my instrument and d) quite simply, I'm too lazy to put it on and too lazy to take it off! There, I feel better now I've got that off my chest! I've decided to be a better beauty blogger by making an effort to paint my nails on a more regular basis and share the results as well as my thoughts on the nail polishes I use with you guys here on my blog in these NOTD posts. They probably wont be super frequent posts, but I hope they may add a little variety to my blog output and inspire me to paint my nails more often! 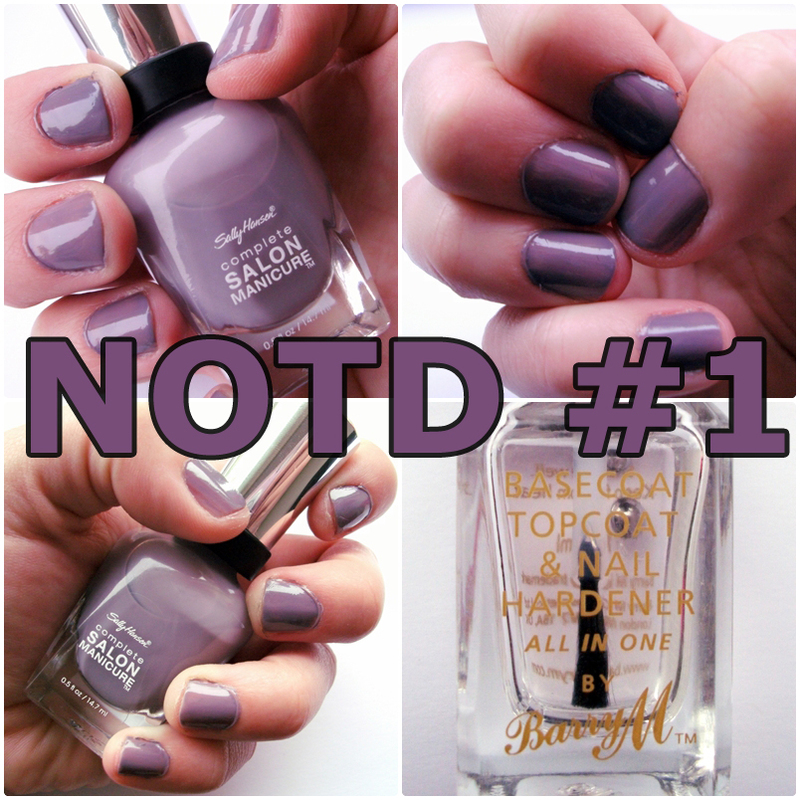 I Purchased this Sally Hansen Complete Salon Manicure Nail Polish in the shade 404 Greige Gardens from Poundland. Poundland is a great place to pick up branded bargain nail polish and I've even had some genuine OPI shatter nail polishes from there recently! I really like the Sally Hansen Complete Salon Manicure nail polish range as the formula and the shade range is fantastic. This was completely opaque by the second coat and I found it to be relatively quick drying. The brush is quite wide and easy to work with. The Sally Hansen Complete Salon Manicure range usually retails for around £6.49 a bottle. I think that the only reason that some of these can now be found in Poundland and other discount retailers is because the particular shades are probably from a few seasons ago. I used the Barry M basecoat, topcoat and nail hardener as a topcoat to add a little extra shine and to hopefully make my D.I.Y manicure last a little longer! Let me know what your top tips are for a long lasting and neat manicure as I am not that practiced in the great art of nail painting yet!